It's not every day that we get a personal invitation into one of our favorite designers' homes. 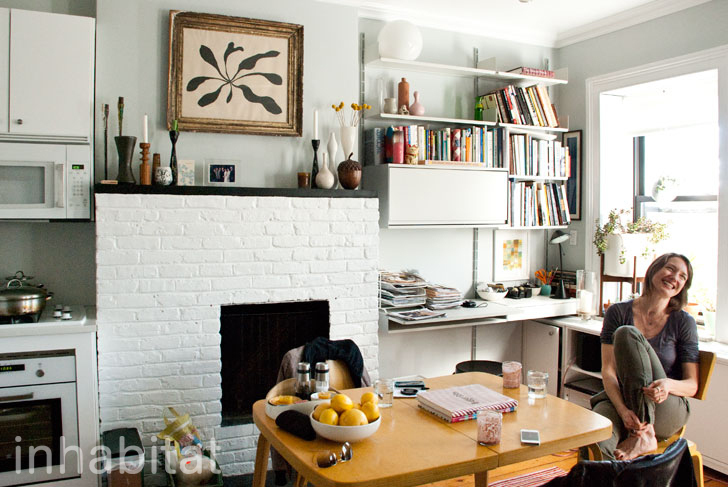 However, ethical fashion designer Marcia Patmos recently made several green changes to her Boerum Hill apartment and invited Inhabitat for an inside peek. By making a few simple changes, such as painting the walls varying hues of grey and adding smart shelving, Patmos was able to enhance the space and still surround herself with her carefully-curated collection of paintings and furniture. With the help of architect and designer Robert Farrell, several vintage items and Energy Star appliances allow Patmos to continue to reduce her footprint and live in line with an ethos she applies to fashion every day. INHABITAT: How long did the renovation take? Marcia: It took about three months, but then it took a little longer for everything to be finalized. INHABITAT: When you were thinking about the furniture, did you search for new items or rearrange what you had? Marcia: I really tried to keep everything that I could keep but selectively got rid of some things. I got rid of some bigger vintage things that used to sit in the middle of the floor against the wall that took up a lot of wall space. We were just trying to get some things off the floor. That’s why we got these components that you can change around or move to another apartment. My couches and things like that were here. I just made slip covers to give it a little face lift. INHABITAT: What were you looking for in terms of materials? Marcia: I used good materials everywhere possible, but then also tried to find things that were within my budget. It’s kind of a mix; it’s a little high and low. The kitchen and the bathroom are IKEA innovations. IKEA’s pretty great because you can do things on a budget and it’s pretty clean and modern and useful. The counters are made from recycled glass. I did invest in Energy Star appliances and the shelving units are really well designed and help elevate things creating an enhanced sense of space. If I ever move, I can even bring them with me and they can become completely different somewhere else. INHABITAT: Was the color scheme similar before? Marcia: It was just all white before. So I just changed the gray and then had the different shades of gray throughout the apartment. I owned all the artwork before but just moved it around a bit. INHABITAT: Can you tell me about the carpet, the inspiration for the colors, and the story behind that? Marcia: The carpet is from a place in Tribeca called Double Knot. The owner is Turkish, and he sells a variety of things. Some are vintage and some are new. For the new items he works with workshops in Turkey or Morocco. This carpet came from a group of artisans in Turkey, and it’s made of kilims that are unwoven and then re-woven in to new things. So it’s a traditional style but made more modern. The colors were my request because I wanted something neutral, kind of graphic but then with just a little shot of color. I loved how the vintage kilims have random designs, sometimes they’re almost like signatures of the tribe. We discussed it, and I showed him the colors I was thinking. I brought an Alexander Girard book which has a lot of pinks and oranges, and they’re apparently very similar to some traditional kilim accent colors so he knew how to describe it to them. We decided to let them do what they wanted within my description, and I love how it looks. INHABITAT: In your latest fashion collection, you included several pops of color that add surprise to the otherwise more neutral and black color scheme. Were you also inspired by vintage kilims and Girard for your Fall 2012 collection? Marcia: Probably in a certain way. Everything’s connected. INHABITAT: What’s the story behind the hand-crafted wood closet in your room? Marcia: I’ve lived here for a while and previously I had ripped out a partial wall and a doorway and it was just a terrible closet that wasn’t spacious. My friend, Miggy Buck, is a furniture maker and sculptor based in New York and she constructed the closet and also built in shelving to better use the space. She built those for me knowing what I like- a little bit of a mid-century style but modern- custom designed for that space. INHABITAT: What’s your favorite result of the renovation you did with Robert Farrell? Marcia: I love how the living room and kitchen space are now joined because it used to be chopped in two. It’s much nicer to have it all open. I also love the gray. I was getting obsessed with it. The color for some reason is calming. + Robert B. Farrell Ltd.
re-use furniture and other home's pieces is always a good alternative. And for less money we can have very cool pieces and a different and personalized decoration. Patmos' apartment is filled with her personal collection of artwork and furniture. Fresh touches abound, the apartment has a light, airy quality. Patmos framed pages she found in an old book with samples from a French Mill. This coffee table was bought from a local vintage shop. It is most likely from the 60s or 70s. Good design makes use of multiple surfaces. Patmos bought this print on handmade paper from local, Bushwick-based artist Mary Judge. Judge's patterns have since influenced several textile designs used by Patmos. A stylish, yet comfortable chair invites visitors to relax. Newly installed Energy Star appliances help reduce consumption. Instead of buying new drinking glasses, Patmos has creatively acquired a small part of her brother's large collection of old jam jars. Patmos found the table pictured above at a thrift store in Providence. The chairs were later found in New York and fit perfectly. A large kilim softens the space and has an ethical history. Patmos worked with Double Knot in Tribeca to design this hand-knotted rug made in Turkey. It is made from vintage textiles and the colors are inspired by the likes of designers Alexander Girard and Bridget Riley. Robert Farrell helped Patmos source a collection of sophisticated, quality shelving units that help lift things off the floor, creating an increased sense of space. The units can easily be dismantled and moved elsewhere. Patmos' bedroom has a country feel with a modern touch. She left the original wood flooring as is. Off-the-ground drawers give the space a lighter feel and match the shelving units in the kitchen and living room. A skylight provides the bathroom with a fresh, natural source of light. Reclaimed wood serves as a perfect side table. Subtle natural touches can be found throughout the apartment. Patmos enjoys the natural light that enters her home, saving energy by providing both heat and light throughout the day.